Le Macine, is an ancient, skilfully and respectfully restored watermill. It offers hospitality in a relaxed atmosphere within the hills of Volterra. Surrounded by a romantic nature. A refreshing swimming pool (length/large 10 per 5 meter; deep 1,20 at 2,20 meter), private parking, balcony and a huge garden promise a beautiful and relaxed vacation. Le Macine was built on 3500 square meters, which are fully at your disposition. Nobody else is in the house. The house's living area is about 160 square meters large. The house consists of1 Bedroom with one double bed and one single bed; 1 Bedroom with one double bed; 1 Bedroom with one single bed and one Bunk bed (or we can prepare it only with one double bed); a huge living room, a big kitchen, (a dishwasher is included) and an enormous terrace, which offers you the possibility to have a BBQ or to just relax and enjoy the nature.The garden is ideal for children and the whole family, who will love the pool.Pets are welcome. Le Macine offers room for a maximum of 8 adults. The house is two-storied and its living space is a total of 160 square meters. The house is an unattached single unit with 1 Bedroom with one double bed (large matress) and one single bed; 1 Bedroom with one double bed (large matress); 1 Bedroom with one single bed and one Bunk bed (or we can prepare it only with one double bed composed of two single matress); a huge living-room (with extra couch-bed upon request), 2 bathrooms with shower, a large, nicely renovated modern kitchen, and terrace on which you can use from barbequing or just relaxing. The pool is located next to the house in the middle of the 3500 qm large meadow which, like everything else, is for your use only. 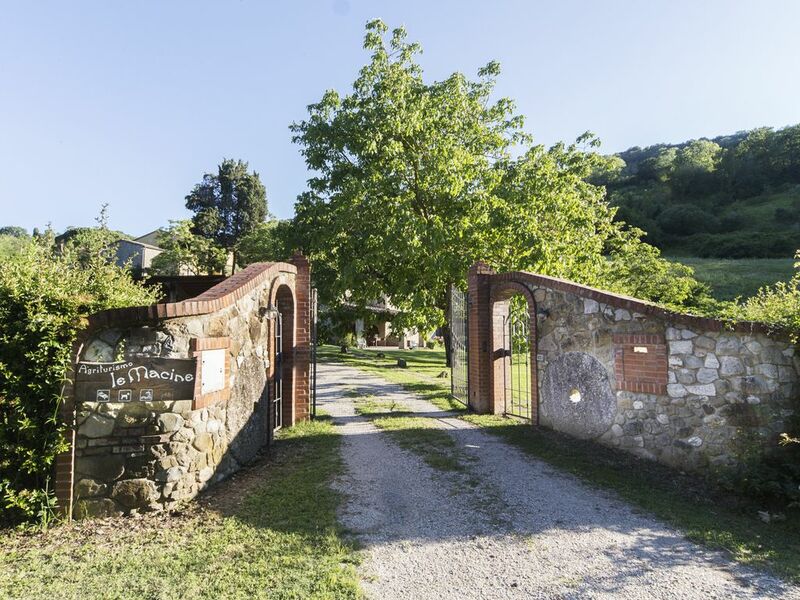 Le Macine is the ideal retreat set in rural Tuscany, a perfect location from which to visit the picturesque towns nearby. Marcia and Alessandra are helpful friendly hosts who also run an excellent local restaurant nearby The villa and gardens are spacious and the large swimming pool is fabulous. The local road can seem busy at the weekends, while the cockerel only adds to the charm of the place. The house was very comfortable, clean and well equipped. Our host was extremely accommodating. And the surround area is beautiful , situated close to charming small towns. We had a lovely winter break in this house. The house was great for exploring Volterra, San Gimignano and we also easily managed Siena and Florence for the day. The house is quiet and away from it all - but equally less that 10 minutes to Volterra. February turned out to be a great month to visit these historic towns as they remained cool and with far fewer tourists. Nice house in a fantastic part of the world. You and your family were extremely kind and it was nice to have you here!! We had a lovely time in Tuscany, and the family that own the property were so friendly and helpful, we had a meal from their Restaurant which was also very nice. Coming from a suburb in the United States, I'm not sure what the previous reviewer means about noises. The street is NOT noisy at all! It is very pleasant with a rooster now and then. But that is what added to the Tuscan feel. We had a family of 8 that stayed there during the holidays and it was perfection! We got in and Alex and his family let us come to his family restaurant and eat there since no other place was open. It was the best food I had in Italy! The villa was rustic and beautiful, the location is perfect and the family that owns the villa are the nicest, most generous people I have ever met! The pictures of the home do not do it justice. Thank you, Alex, for the best Italian experience of my life. We will truly miss the home and your family! All that was said in the previous reviews is correct, but the missing part is the "sounds and noises" department - this may or may not be important to you, but without it, the picture is not quite complete. First, what you will not hear: basically anyone on the phone. There is virtually no mobile coverage in or around the house; if you need to be reachable on holidays, this location is not for you. Second, what you will hear - cars and roosters. The former was the bigger issue for me. The road on which the property is located almost directly is busier than you might assume from the map - there will be quite a bit of traffic on it during weekdays, including lorries, and motorbike traffic on weekends. If traffic noise bothers you, this is not a location for you. Second, although the neighbour's roosters are part-and-parcel of "agrotourism", if you are a city person, you might still be surprised by how early they actually start. If you can get over the above easily, you will have a wonderful holiday. The house is not old but does a good job looking the part, the furnishing is simple but functioning well, the house is clean and well kept, and the garden and the pool are just great. Le Macine is located in the “Valle d’Era,” a valley 8 kilometers from Volterra, close to public transportation systems. Volterra, “the City of Winds and Cliffs,” that never ceases to amaze: the city is rich with culture that stems from its history, with arts and crafts, and with simple, yet outstanding Restaurants. It is located in the heart of Tuscany. The house is located 25 km from San Gimignano, 50 km from Siena and Pisa, 80 km from Florence, and 40 km from the peaceful sea.